Today’s blog is a shared effort by Matt and his mom. Nancy wrote the post that resulted from a lot of discussion with Matt. Two recent Sundays on the Horse Range served as a reminder that life goes on. Last Sunday was hot…unseasonably hot. 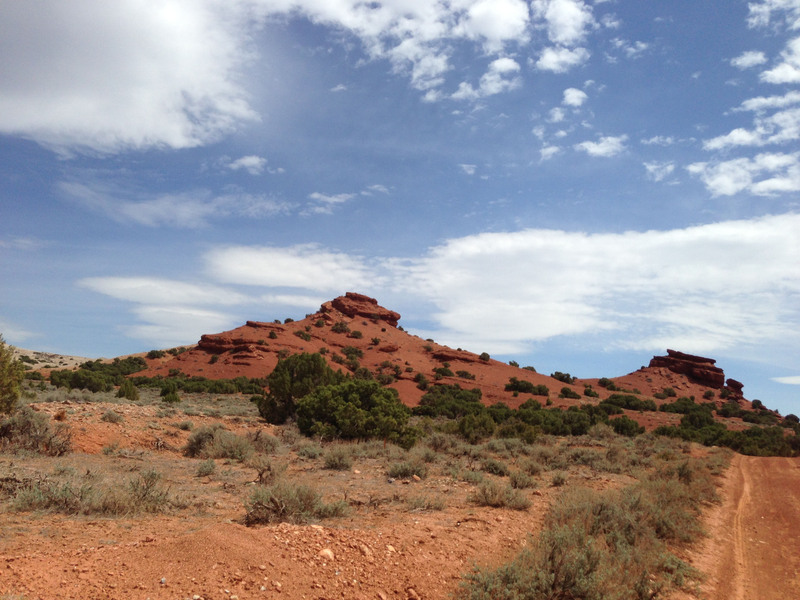 I drove out to the Red Hills with the goal of hiking out to Turkey Flats both for a beautiful place to hike and the possibility to glimpse wild horses. Instead of heading west out to the Flats, I followed a fresh set of horse tracks to Cottonwood Springs. Lots of sign led me to the cool shade of Cottonwood and a filled-to-the-brim water catchment, but no horses. Sunday, May 19: Today’sweather was in stark contrast to last week. The old adage, “if you don’t like the weather in Wyoming, wait five minutes” is definitely true! A trip to Big Horn Canyon is the perfect way to spend a windy, rainy day. 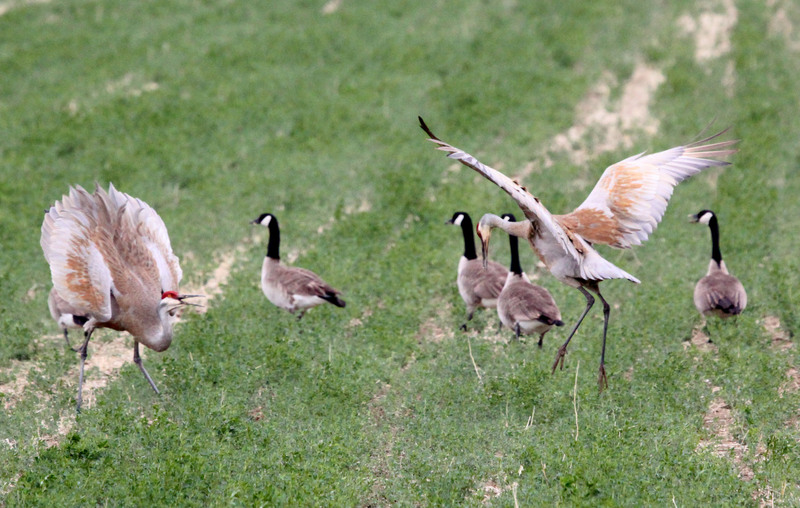 On the way to the Range, a pair of courting sandhill cranes among a group of geese provided great entertainment. As soon as I entered the Wild Horse Range, I carefully scanned high and low with my binoculars, searching all the old familiar spots of the Canyon area. But not a single horse was to be seen. On both days, I had lots of time to contemplate about the wild horses and the nearly ten years that Matthew and I have spent with them. Even though I didn’t actually see horses, there is no question in my mind that they are there somewhere out there. This confidence comes from two sources. First, there were signs of horses everywhere. 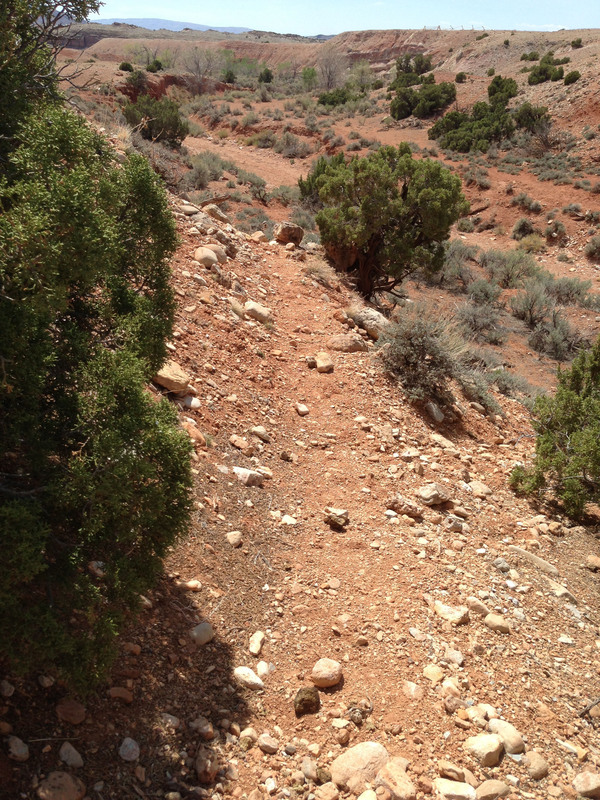 Following their well-worn paths up and down the rugged terrain was a sign. Fresh stud piles indicative of recent activity were signs. Secondly, there aren’t many spots out in these lands that I haven’t observed horses using. Images from the past filled my mind as I wandered through the lands. One of the most dramatic scenes I had ever witnessed happened in 2005. It involved Cortez and Lone Wolf battling it out for Strawberry and her foal, Fools Crow. The two stallions raced for hours on Mustang Flats. Sadly, this event ultimately ended Cortez’s life and forever changed young Fools Crows existence on the horse range. I don’t drive past that spot without thinking of Cortez. Cortez and Lone Wolf have a battle of endurance as they race across Mustang Flats. The mighty Cortez stands proudly after the battle with Lone Wolf. This event left him injured which led to his death nearly a month later. Each wild horse has a story that gets etched in my mind. Even though the horses weren’t visible on this day, the lives of the Pryor horses indeed go on, both on the Range and in my memory. My two Sundays on the Range gave me plenty of time to think about Matthew’s and my “life” with the wild horses, with the Center, and with this blog. He gets questions on why the blog has supposedly “ended.” We get questions on whether or not we are still involved with the wild horses. The entire Board of the Pryor Mountain Wild Mustang Center gets questioned on what is happening at the Center. Speaking for the two of us, our commitment to and love for these horses has not diminished. Trips to the Range are still a part of our lives. Matthew stays active with the activities and decisions of the BLM to ensure the best possible solutions. I enjoy giving wild horse presentations to the local school children. We continue to be a part of the Board of Directors at the Center and seek solutions to maintain that organization. We appreciate and value others such as Ginger Kathrens and Sandy Elmore for their work out on the Range monitoring the herd dynamics. 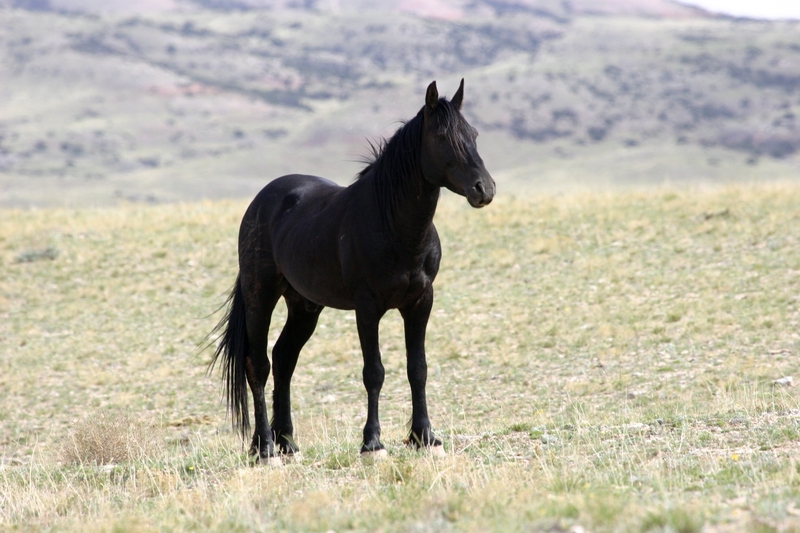 Perhaps our visibility with the wild horses isn’t as noticeable as it has been in the past. But let me assure you, that much like the wild horses on the last two Sundays, lack of visibility doesn’t mean lack of existence. Life goes on.